Pretty much, this is a list of the stuff I've used to support my addiction over the years. Well, I used it nine years, heavily. And, honestly, it served me well. But I finally decided it was time to get a pump machine, and now I can only describe this little beastie as "Kruppy". But, at least it didn't have one of those lame crema-producing devices on it! Foam production worked pretty well once the lame "foam producer" was removed. I was even able to make microfoam occasionally... At the time I got it, this was probably the best of the steamers. Made a pretty good cafe au lait / latte impression. This device was once part of a commercial system that brewed directly into the pump pot. This wonderful pot was a gift from a friend who is a coffee distributor - the pot has a small dent in the side and was no longer able to be used commercially. Holds two pots from my 10 cup Mr. Coffee, about half of a gallon. 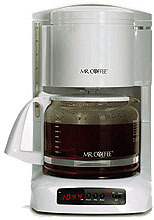 Keeps the coffee nice and hot for 8 hours, and warm enough to be good for at least 12 hours. I have used this machine for a long time. Make a great drip, and it is perfect for most of my needs when guests are over - unless only a few are over, then I may do my barista impression with Silvia. My old Braun didn't grind fine enough, so I modified it to work tolerably well until I get a new grinder. I took off the bottom of the unit and loosened the nut on the set screw. Then, holding it upright with a screwdriver on the set screw, turned on the motor and tightened the screw (raising the bottom set of burrs) until I heard the burrs touching, and then I backed off a little, tightened up the nut, and put it all back together. I am now able to use this grinder to pull ristrettos from my Silvia, but I must use a heavy tamp (more than 30 pounds) for a proper 25 second shot. But this is better than the 10 second doubles I was pulling before modifying the grinder, even with very heavy 60 pound tamps! Note that there is still a little too much dust in the grind, so the cup has too much sediment compared to a shot done with grinds from a good grinder - I am comparing to grinds from my local shop after they ran some beans through their Mazzer Super Jolly. I hear this moidification still works on the current model of Braun burr grinders, the KMM-30. Mine is the older KMM-20 Type 4045. NOTE: You can give yourself a shock if you are not careful. In the worst case, you could electrocute yourself. I am NOT responsible if you do! You are doing this AT YOUR OWN RISK! Started with one of this doohickeys for my coffee, and used it a few years. Shortly after I got my coffee steamer, I managed to upgrade to the Braun burr grinder. Nowadays, it grinds flax seed and spices, wihch is the perfect use for one of these!